It’s always hard to buy the big man in your life a gift when he owns most things! That’s why I believe in gifting something unique, thoughtful and unexpected, that he is sure to love. As it’s Father’s Day on 17 June and I have got together the must-have GS Father’s Day Edit, for all ages and all budgets. The 2018 collection focuses on seasonless style, creating a multifunctional knitwear edit that will see your wardrobe for 365 days, whatever the weather. Modern classics and unique statement knits that are worn for years to come, styles you can rely on no matter what the season. Those special styles that become key pieces of your sartorial wardrobe, celebrating all things Slow Fashion and Modern Heritage. A unique piece of knitwear that is exclusive to the GS Shop, discover the collection here. The GS Sock subscription! The gift that keeps on giving….. every month to be exact. How does it work? 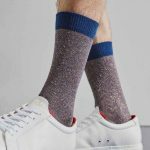 Sign up for only £14 a month and receive a surprise pair of GS socks, delivered straight to your door every month. 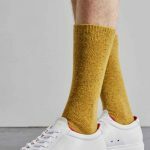 The socks will be seasonally appropriate in exciting new colours and patterns. Available in sizes 4-7, 9-11, 11-13 UK.